I made this card to enter in the Rose on Paper Challenge. I was in the mood for a little spring-time! After all the deep rich colors, it was nice to go for a little soft and sweet! The back-ground behind Tilda is air-brushed with my copic system as are the flowers. I got the idea to do the flowers from Rach. It works brilliantly! Speaking of Rach, she has lovely candy on her blog to celebrate the New Year. So hop on over and be prepared to be stunned by her amazing creations! Have a great day! Don't forget that tomorrow my blog candy ends and I will be picking a winner for my Whimsy Candy! Jeanette what a lovely card!! 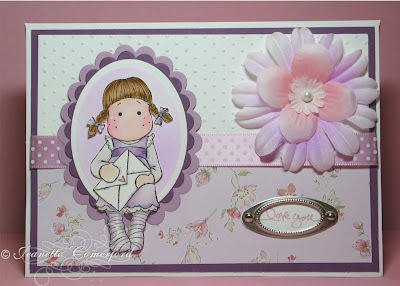 I love the soft colors you used and your air-brushing on the flowers is stunning, love it! Thanks for playing along in our challenge and good luck! Oh Jeanette!! So very soft and pretty!! Tilda is adorable!! Jeanette this is adorable! I absolutely LOVE this card! That Tilda is darling! Gorgeous sweet card. Very pretty. What a lovely card, Jeanette! Love the papers and your colouring!!!!!! whouah !!!! Jeannette ta carte est vraiment magnifique j'adore les tons que tu as utilisé !!! bravo !!! Jeanette this is too pretty! Love how you can airbrush these flowers, new to me. I know you'll be busy with DT but I've left something on my blog for you. Have a great day! Oooo Jeanette that airbrushing is amazing. I'm with you on using some more pastel-y colours.